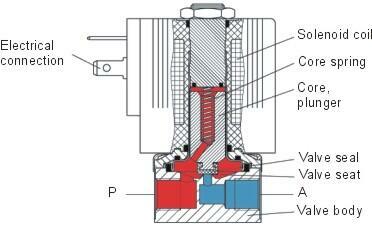 Direct-acting 2/2-way plunger-type solenoid valves (e.g. Bürkert Types 6011 and 6013), also referred to as through-way valves, are shut-off valves with two ports: one inlet P and one outlet A, see Figure 1: Inlet P is connected to the pressurized fluid or gas. In the de-energized state, the core spring, assisted by the fluid pressure, forces the solenoid core (plunger) with the valve seal onto the valve seat; passage to outlet A is thus shut-off. If voltage is applied, the solenoid core with the valve seal is pulled into the coil as the result of the magnetic force and the valve opens; the passage is unobstructed again.